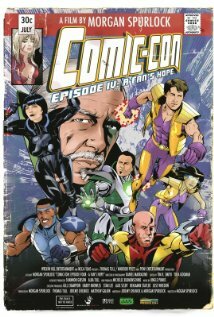 Comic-Con Episode IV, A Fan’s Hope, directed by Morgan Spurlock. Comic-Con. Two small words, but to those of us who love comics, movies, or video games, they mean so much. It’s a 150,000 person nerdgasm that happens every year in San Diego, California. There are literally dozens of other cons that happen all over the world, but when you say Comic-Con, you mean San Diego. It’s the largest event in geek culture. And this, the latest in Morgan Spurlock’s endless stream of “documentaries” that don’t actually document anything, is about that event. Or at least that’s what I thought it was about. Unfortunately, it’s not about the San Diego Comic-Con at all. In fact, there is almost no mention of the history, or current status, or anything really, about the con at all, other than that it’s a) really big and b) people really like it. What this film is really about, is a dream. You know the dream. Everyone has it, really. It’s not specific to comics or movies though. It could be sports. Or chess. Or Nigerian barrel juggling. It’s the dream to be more than what you are, and to succeed at your secret desires. And while those dreams may be admirable, they’re probably more appropriate for a film about an inner-city basketball program, or a spelling bee featuring kids with last names I can’t pronounce. In this context, they just come across as a longbox full of maudlin sentimentality. Spurlock divides his movie into 6 or 7 major segments, each focussing on a different personal story. And so we are introduced to the young lovers who met at the previous con, the struggling artists wanting nothing more than to work for Marvel one day, and the costume designer wanting to become the next Jim Henson. They are all admirable endevaours, and each are entertaining in their own way. Watching people follow their dreams is always a recipe for success, and Spurlock shows a steady eye for good storytelling here, something that has often been missing in his other films. But any documentary that starts with such a bold assumption (that is, that the event we’re documenting is inherently a good thing), isn’t really a documentary at all. And this definitely isn’t. What it is, is a 2 hour commercial for a trade show. A trade show where you can have the chance to meet a lot of people that feel the same way that you do about Klingon mating rituals, sonic screwdrivers, and bikinis worn by Carrie Fisher in 1983…. but a trade show nonetheless. While almost every story covered here is entertaining and worth watching, they are stories that could have been transported into almost any interest: Stamp collecting, sports, 1dancing with failed celebrities, etc. We are told a lot about the people going to the con, and why they’re going there. What we aren’t told, is almost anything to do with the con itself. It’s mentioned in passing that the con is bigger than it used to be, and that comics are barely even covered there anymore. But what isn’t covered is why. No one reads comics anymore, even though geek culture is bigger than every before. Sci-fi literature sales are dwindling, yet action movies that pretend to be sci-fi are massive. To me, that’s the real story here, but Spurlock chooses to gloss over that and instead showcase a fabricated public marriage proposal that wouldn’t have been out of place on Hockey Night In Canada. It’s entertaining, but it tells us nothing about what the movie says it’s actually about: Comic-Con. Comic-Con is important because it showcases everything that is good, and that is bad, about today’s geek culture. What used to be a burgeoning subculture of underground comics, films, and novels, has been bought and paid for by multi-national corporations. And as a result, everyone who likes movies is now part of the club. Let me tell you something folks, liking The Matrix doesn’t make you a geek. Reading Shaolin Cowboy, the comic created by the guy who did production design on The Matrix makes you a geek. But in this new, homogenized world of geek acceptance, everyone is granted access. Liking shows that everyone else watches, and reading books that everyone else reads, isn’t geeky. It’s mainstream. And if it’s mainstream, then it’s not special anymore. And if it’s not special, then why does this movie go out of it’s way to pretend that they are? These are important questions to ask as geek culture changes and grows, and the answering of those questions would make an interesting movie. Unfortunately, Morgan Spurlock didn’t choose to make that movie. What he chose to make was perfectly serviceable TV quality puff piece about nice people that like to own things. That they happen to like to own some of the same things that I do, doesn’t make it any better. This entry was posted in Comic Books, Movies and tagged Comic-Con. Bookmark the permalink. For those of you reading this blog that have a heart, then you will find lots to love about Comic-Con (the movie). If we’re judging a movie based on how well it fulfills your expectation of a label, then it does not succeed as a documentary. But as far as being an entertaining movie about people who live outside the norm (no matter how many people like Star Trek or Mass Effect – it’s still outside the norm of what ‘normal’ people like and isn’t mainstream), it succeeds admirably. I had a huge smile on my face the entire time as we watched these real people trying to achieve their dreams. Star Trek and Mass Effect are as mainstream as Law & Order and CSI. Same as Star Wars, and Twilight. No difference. And I’m not cynical about love or hope, I want a movie about Comic-Con. Hopefully one day I”ll get it. Why is there no conventions for Law and Order or CSI then? Mostly because no one is as passionate about these properties as they are about the more geeky IPs. I do agree that this is not a movie about Comic-Con, it’s a movie that uses Comic-Con as a backdrop for the stories of these individual ‘characters’ – and it worked for me.